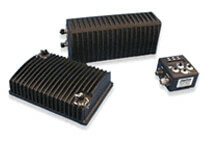 This SATCOM transportable system provides 20-40 watts of RF output power into a 2:1 VSWR load at 50% duty cycle. It also amplifies RF signals from a satellite antenna in the receive direction (LOS antenna signals are passed through un-amplified). It is completely self-contained, with internal transmit/receive switch, DC/DC power supply, and automatic/manual LOS Bypass mode. The PA/pre-amplifier is remotable up to 300 feet, via a single coaxial connection (Bias-T configuration). The system accommodates all PSK/FSK modulation techniques and TDMA/DAMA formats as provided by any DAMA terminal meeting the input frequency and power range requirements, in accordance with JITC standards. Tx/Rx function of this HPA is activated by the presence or absence of RF from the radio. The remote control unit for this SATCOM transportable allows operator control of output power levels; receive power levels, SATCOM/LOS control; and displays RCU and amplifier status and operating time. It can be powered by either a +28 VDC MIL-STD-1275A or 110/220 VAC universal power source. PA/Pre-amp: 4.5" W x 5.5" H x 12" D, 12.2 lbs. AC/DC Power Supply: 8" W x 2.6" H x 11" D, 4.5 lbs. Remote Control Unit: 3.6" W x 5" H x 2.8" D, 1.75 lbs. Operating +/- 15 g, 11 msec.